← Raise a glass – cooking with beer at the 100th Penshurst Farmers market…..
November at your farmers’ market…..
Penshurst Place – perfect for a visit after you’ve shopped the market…. The year is already rushing by and it’s already half term and the end of October. Someone told me this weekend it’s only eight weeks till Christmas and here I am still mourning the end of the wonderful summer and the mild spell that has just blown out with the big storm. I lost the old apple tree outside my front door – in fact I nearly lost my front door but luckily it the tree just came to rest neatly on the guttering. At least the last of the apples are now easier to pick! And the tree was on its last legs anyway and was going to have to be taken out…. 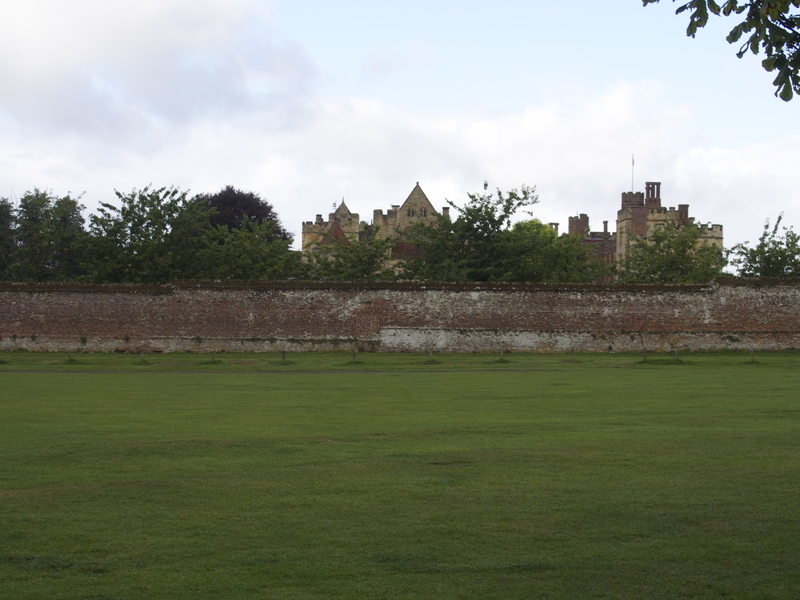 The storm has brought benefits for this Saturday’s market at Penshurst too. A text from Paul the fish at Arcade Fisheries alerts me to the abundance of sea bass he will have on his stall as a result of the stormy seas. I’ll be buying a couple and baking them whole with shredded leek, ginger, garlic and soy then serve with a chilli and soy dipping sauce. 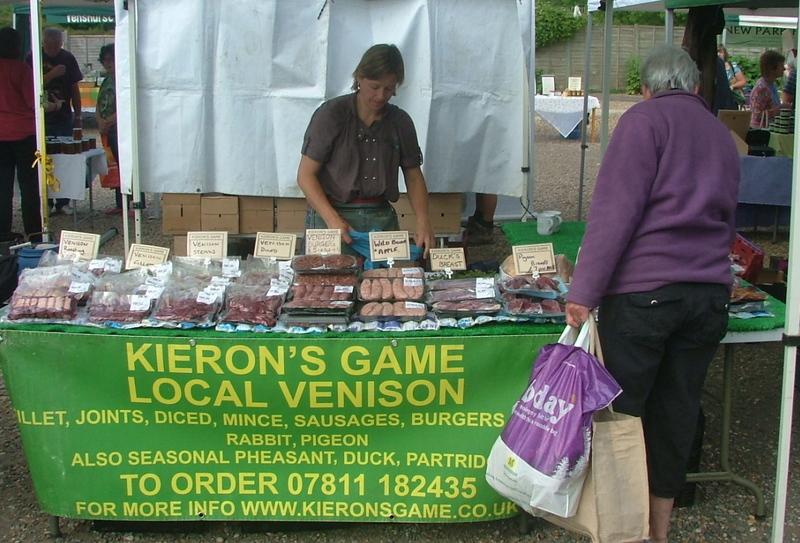 I’ll also have space in my basket for Kieron’s completely delicious venison fillet steak to go in the freezer for later in the month. I discovered it last year when I cooked game with Kieron at the market and have never eaten a better steak. It’s wonderful cooked classically au poivre or with a bearnaise sauce. I hope to put the recipes up next week along with the beer recipes I did at the October market but have been too busy on a new work project to blog about. The clocks have gone back, we are heading into short days and cold nights, and we all crave a little comfort from the kitchen. Slow-cooked casseroles, satisfyingly starchy creamy mashes, rich flavoured roasts and warming puds all fit the bill perfectly so wrap up and head out for a trip to your local market for inspiration. It’s a treat for all the senses at this time of year especially if we get some late autumn sunshine to set off the hues of the season. This is also the month to place your orders for Christmas treats to pick up at the December markets so go prepared with your shopping list to ensure you get just what you want. Game is the meat of choice for cooks in November as the season is well under way for birds such as pheasant, partridge and wild duck. Venison is available both farmed and wild in many markets, and makes a healthy choice as most wild game has 5% to 7% fat, compared to red meat such as lamb with 25% or more, depending on the cut. The lower fat content means careful cooking to avoid the meat drying out, so the old traditional slow cooking methods in stews and casseroles should be reserved for older game birds. Most game is very carefully selected and prepared by your game dealer and no longer hung to quite the same stage of ‘gameyness’. Less strong and much more tender, it calls for more modern, time-friendly techniques such as flash frying, grilling or even home smoking are better suited to lean, tender cuts. Look online for ideas as plenty of chefs are discovering the joys of cooking with game. If you want to slow cook for great comfort eating, look out for the cheaper cuts of beef, lamb and pork – shin of beef, belly pork, or lamb neck all cook down to meltingly wonderful mouthfuls of flavour, perfect for colder days. Root vegetables are at their tastiest now and perfect for mashes, gratins and soups – they improve with the cold and you will notice a marked difference in flavour from locally sourced varieties compared to supermarket specimens. Look out for parsnips, Jerusalem artichokes, swede and turnips. Try cooking peeled, cubed celeriac with a couple of cloves of garlic in the cooking water then mash with a big dollop of local produced butter to go with venison or roast beef. Main crop potatoes are full of texture and flavour and the varieties available locally are worth exploring. Ask the stallholder for advice on which potato to buy – the right one, floury or waxy, will make all the difference to the finished dish. The brassicas really come into their own this month too – kale, Spring greens, and all kinds of cabbages are wonderful in stir-fries, soups, and hashes or just steamed with grated nutmeg and more butter! And red cabbage cooked with apple, spices and red wine is another seasonal treat to go with rich pork, or maybe a roasted wild duck. Apples are available in abundance this year so try as many local varieties as possible – Bramleys are perfect for using in mincemeat and Christmas pudding so buy them ready for stir up Sunday at the end of the month. The eating varieties can be used in tarts and cakes. Colder waters make for high quality fish and seafood, and as the temperature drops the range available just gets better. At the luxury end of the scale, treat yourself to the very best crab, lobster and oysters. For fish, Dover sole, turbot and halibut are rightly considered the very finest eating by cooks and chefs. But also this month why not try some of the lower cost alternatives as many are at their best. Brill is a real discovery if you haven’t tried it before – a firm white flesh full of clean flavour that only needs simple cooking. Or opt for healthy mackerel and herring, full of valuable Omega 3 fish oils. Toast the cashew nuts in a frying pan over a high hear until just lightly browned. Place in a blender or small processor with the garlic, ginger and 4 tbsp cold water. Process to a paste. Heat half the oil in a medium flameproof casserole and brown the lamb on all sides in batches. Remove with a slotted spoon. Heat the rest of the oil in the pan and add the onions. Cook over a medium heat for 5 minutes until softened and browned. Add the cumin seeds, coriander, cayenne, cardamom and cinnamon stick and fry for a minute. Stir in the cashew nut paste and cook for another minute. Return the lamb to the pan and add 200ml cold water. Season and bring to the boil. Half cover the pan and simmer the lamb gently for 1 hour, stirring occasionally, until the liquid is reduced by at least half. 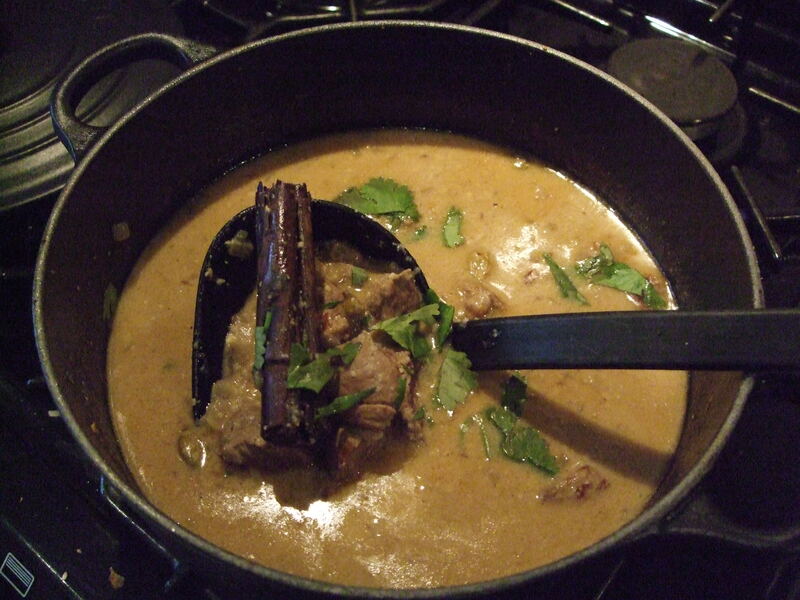 Add the coconut milk and garam masala to the pan and simmer for a further 15 – 20 minutes until the lamb is tender and the sauce thickened. Add the lemon juice and scatter with chopped coriander. 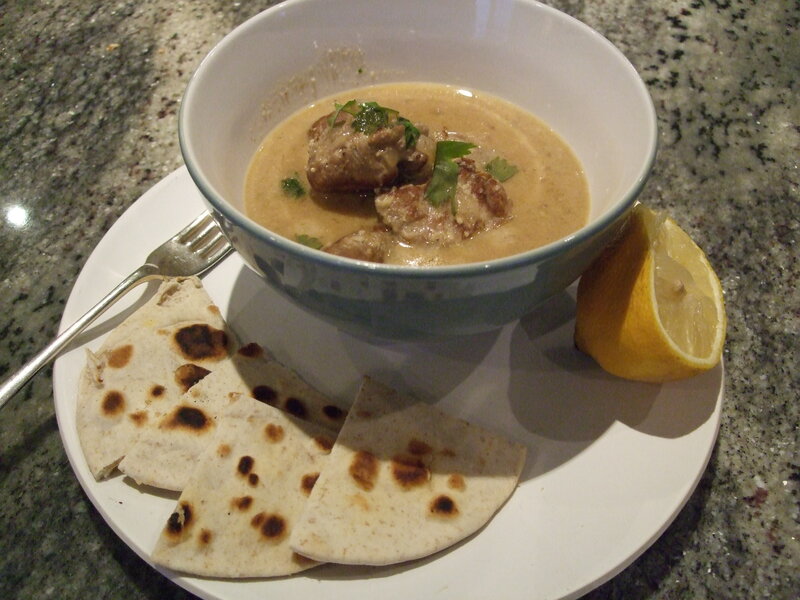 Serve with warmed naan bread or steamed rice. This entry was posted in Farmers Market, In season and tagged farmers markets, Game, Kent farmers markets, lamb curry recipe, sea bass. Bookmark the permalink.